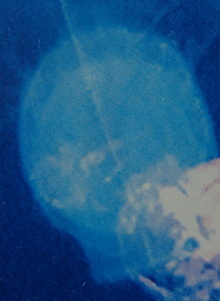 A crystal skull forms in blue light above Marcus's head at QUANTUM CAMP 2007. 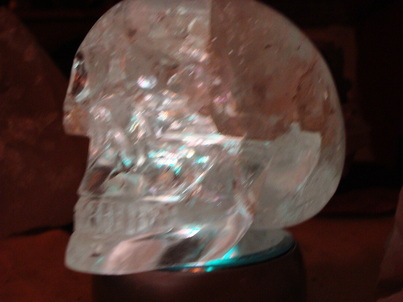 Rotated 90 degrees the crystal skull that appeared at Quantum Camp is very similar to the photo of the light crystal skull. Alternate dimensions exist 90 degrees to each other and vibrate at a higher or lower frequency. Note the outlined circle of the right eye as it appeared at Quantum Camp and compare it to the protruding right eye of the light crystal skull. Over a year after Quantum Camp I was introduced to the crystal skulls and took this photograph of the light skull. ​We were ecstatic as we watched the white light form around Bill and the blue light form a crystal skull over Marcus's head. Chris took this photograph at Quantum Camp a year before I accessed the crystal skulls for the first time. We were watching a preview of coming attractions. Braden and Levi were playing with streams of light coming down from the sky. A friend organized a Fairy gathering in Women's Park in Helena on a June afternoon back in 2007. As I was leaving the park there was this sudden realization that I was surrounded by a group of teenagers. I asked what was happening and Chris replied, "Will you be our teacher?" I responded with "How did you find me?" Chris said "We sent out a scout. We identified you and the scout confirmed. Our instructions are to keep you here until Braden arrives." Braden had attended a play-shop at our home when he was sixteen and had demonstrated incredible intuitive abilities. I was intrigued. They called themselves the Quantum Kids Their story was that some of these kids had met in grade school and had made a pact that they would not tell the adults what they did. They had waited until they were eighteen years old so they no longer required parental permission. The Quantum Kids set up a camp at Hellgate Campground which is in the vicinity of the Shaman Rock. Eleven Quantum Kids were there when the three adults, Bill, Colleen and I arrived. We went into the forest. Bill gave instructions for a shamanic journey. My husband, Bill, is our Chacmool which is a Mayan concept of a guardian of inter-dimensional spaces. He uses the drumbeat to open the portals and conduct us safely through. Bill, Colleen and I have journeyed together many times with a variety of groups. Often some members of the group have the same identical experience. We see the same vision of an event that actually occurred in the past in this 3-dimensional consensus reality. At Quantum Camp we explored the variety of expression of intuitive abilities with the parameters that the results are verified in this reality. Photography is one modality that verifies experience. Streams of light, forming a torus, swirl around and above us. David and Levi spin the energy. A configuration of golden light forms above our heads. I asked Levi about his gifts and how he accessed them. Levi stated simply, "I bi-locate... I can be in two places at the same time." The conversation evolved into the importance of confirmation of these elegant experiences in consensus reality. That night Chris captured on camera Levi's experience of bi-location. Levi's solid 3-dimensional physical body is on the left in the photo and his astral body is on the right just behind a hand in the foreground. Note that Levi's head is just slightly turned more in the astral projection image and his shirt has reversed colors. There is a red spiral of light emanating around his left wrist in the astral image. Levi's mother tells me that she has two photographs of Levi as a child around a campfire that depict images of two of him in the same photo. She thought that she had just double exposed the film. 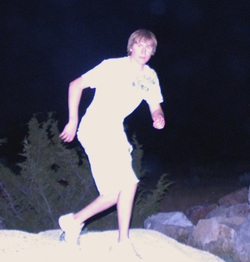 These photos were taken with a digital camera in 2007. There was no film to double expose. The photograph has not been altered. The yellow diamond in the background is a traffic sign. We confirmed the sign as the adults went back to the campground to check out perspective. Braden instructs Chris to take a photo on his count of "one, two, three." The entire sky lights up. Marcus and Kate are surrounded by orbs. 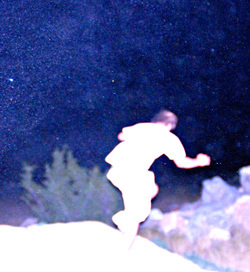 Chris photographed the beginning stages of the formation of a infra-red astral body. Notice that in the 3-Dimensional solid body Troy is smiling. In the astral body the lips are closed. Metaphysical and spiritual traditions encompass the concept of forming a double, sometimes called an astral body or a light body. In the Catholic tradition Padre Pio was witnessed in different places in the world at the same time. Padre Pio formed an astral body that was solid. The Women in Blue is the account of a nun in France who bi-located to New Mexico to teach the Natives about the Black Robes and the coming of the Spaniards long before they first arrived in the Native village. A church with the cross had been built when the Spanish Conquerors invaded which saved the village from annihilation. These events are documented as part of the process of being ratified as a saint in the Catholic tradition. The Buddhist and Hindu traditions are replete with eyewitness accounts of spiritual masters who have been seen in different locations at the same linear time. Native Australians enter “dream time” to travel and communicate across long distances. Carlos Castenada wrote about the forming a “double” or a light body which is perceived as a “luminous egg”. (See photo of Blue Orb on the Orb=Crop Circles page). Modern metaphysical literature refers to this process as forming an infra-red body on the astral plane. "The transition from one phase (our world) to another world would be the equivalent to the passage from one plane of existence to another in a sort of inter-dimensional metamorphosis. It is a case of worlds within worlds. Magnetism is thought to be the key factor in the control of these dimensional changes." David Hatcher Childress, Antigravity and the World Grid page 128. Forming group mind with intention increases access to the quantum field. The original intention of Quantum Camp was to form group mind, to dream the same dream, to experience the same experiences and validate each other. Braden and Levi are “pulling down tubes of light” from the sky above to the earth below, healing Mother Earth and connecting us to ourselves, each other and our home among the stars. A faint magenta fork of light is visible just above the ground on the left. During the shamanic journey earlier that day David had visioned a serpent. David drew the image of the serpent on a piece of scrap paper. The serpent image stimulated a long and intense conversation about embed religious belief systems verses direct experience in the Quantum Field. One of David's companions suggested that he move out of his head and into his heart to access his own power. The exact configuration of the serpent that David drew earlier in the day appeared in pure white light coming out of the left side of his head moving toward his heart. David attended Quantum Camp in 2007 at my request to assist with teaching. He had already demonstrated incredible abilities. David was home schooled. He refers to his education as being "unschooled". A few years before Quantum Camp, David had been diagnosed with a degenerative genetic disease causing blindness in his left eye. David's mother had informed us that tissue samples were sent to four different labs and the diagnosis came back that his eyes were deteriorating rapidly. Doctors gave the prognosis that he would also be blind in his right eye within six weeks. ​David's mother brought David to a play-shop where we joined in a Shamanic Journey..forming group mind. In the shamanic vision we saw an event that had transpired in the past. The residual energy from this past event was manifesting as an ocular abnormality in the present. During the Shamanic Journey we altered the present timeline and restored the original, healthy DNA codon template. Within hours his vision was restored in both eyes. We celebrated after his doctor's appointment where he was tested with 20/20 vision. Thrive What on Earth Will it Take? , a new movie begins with a holographic representation of a torus. THRIVE explains in graphic detail the issues now facing humanity and how toroidal field technology will assist in solving our energy and planetary problems. THRIVE IS A MUST SEE. A few weeks after the Shamanic Journey we celebrated David's gift of vision by giving him with of a box of Wizard Tools created by Janet Spencer. David reached into his new tool box, extracted the glass ball and held it for a few moments. The ball lit up with a golden light. David's brother Nathaniel announced, "I'm a wizard too." At that very second an orb formed in his right hand. He was holding a glass bowl of desert in his left hand. They say that psychic talent is often genetically linked. 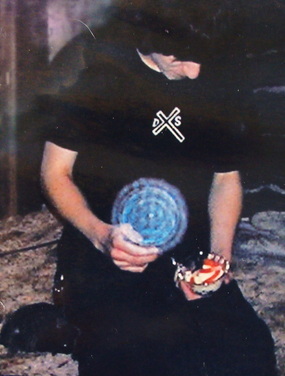 The blue orb in Nathaniel's hand matches a crop circle. David is holding a medicine bag with a crystal inside. I am watching David and Levi closely to assure myself that they return to this earth plane (as if I had any control whatsoever over where or when they manifest their talents). us that we were protected. Orbs appeared in profusion. The energy was smooth with a velvet texture sparkling with crystal clear light. The morning after, before leaving the camp, Colleen made fourteen CD copies of the original photographs. We each hold a CD so we can prove that the photographs were not altered. As we closed the ceremonies the adults expressed our gratitude and commitment to the Quantum Kids. "You asked us to be your teachers but how do we teach you when you are light years ahead of us?" The three adults offered to provide a safe place for the expression of these gifts with total acceptance and protection. These Quantum Kids were launched into the world where life experiences will teach them to use their gifts and integrate them in a good way. Our intrepid photographer Chris is up front and center in this orb photo which was taken a short time after Quantum Camp. Marcus is appropriately attired in a shirt with a counter-clockwise blue spiral spinning like a wormhole. "One of the key principles of quantum physics is that our thoughts determine reality. Early in the 1900’s they proved this beyond a shadow of a doubt with an experiment called the double slit experiment. They found that the determining factor of the behavior of energy (‘particles’) at the quantum level is the awareness of the observer.For example: electrons under the same conditions would sometimes act like particles, and then at other times they would switch to acting like waves (formless energy), because it was completely dependent on what the observer expected was going to happen. Whatever the observed believed would occur is what the quantum field did. ​The thing is, the quantum level of reality isn’t a local and insignificant aspect of creation. It is all around us, and it is the most fundamental level of creation aside from the unified field itself. The human energy field is interacting and influencing the quantum field all around us at all times and the energy of our beliefs and intentions are infused into our energy field because they are defined by the energy of our thoughts and emotions." See Earth Energy Grid Page for the alignment. See Dolmens in Montana Page for more dolmen photos. In 2012 one of the Quantum Kids introduced me to his Mentor. This man wishes to remain anonymous however he gave me permission to tell his story and publish some of his photos on my website under the name of Almost Alien. 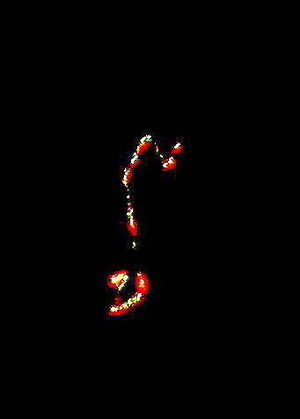 Since 2010 Almost Alien has been photographing his conversations with an Interdimensional Being he refers to as BOTL (Being Of The Light) The name is pronounced "Bow Tell" .Almost Alien asks questions, points the camera exactly where BOTL indicates and takes the photo. Light configurations from the MORPH respond to and answer his personal questions. Other people can see these lights through binoculars or the camera lens when Almost Alien tells them where to look. The Quantum Kid verified this. Almost Alien sent this message.."Hi Julie, I live off the grid so power other then my phone is not a option. Having lived on my mountain for the last 14 years is different then when I was living in Boston. But had I not moved with the direction of my friend Botl -- I would not have had the contact as strong as it is. It is humans nature to build walls which many will not tear down. Even when some humans get upset over earthly things they are still in their comfort zone. It's what they are used too. But for the many of us the walls were never there. We are truly the lucky ones." Almost Alien lives on the Torus North Earth Energy Grid Line high in the mountains of Montana. Found a video link that shows similar light forms. Wait for it...the video starts with a black sky minute.